According to legend, the appearance of a saltire in the skies over Athelstaneford in East Lothian once inspired a ragged band of Scots to defeat a mighty English army. Gripping the same emblem in his fist Alex Salmond yesterday pledged to lead his country to an equally unlikely victory, by establishing St Andrews Day as a bank holiday, despite the forces of bureaucracy ranged against him. 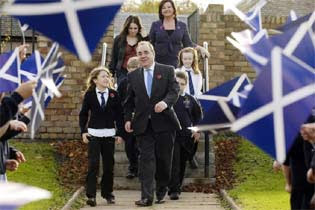 Surrounded by flag-waving school children, the first minister launched a St Andrews Day and Winter Festival, saying he would “lead by example” and establish 30 November as an official day off for everyone who works for the Scottish government. Other employers would quickly follow suit, he added. However Mr Salmond’s desire to create a holiday to rival the exuberant and lucrative celebrations associated with Ireland’s St Patrick’s Day remains thwarted by legislation passed last year by the Scottish parliament. A private member’s bill introduced by Dennis Canavan, the former independent MP for Falkirk, ended in a compromise under which banks and other organisations were permitted, but not compelled, to close on November 30. Business leaders argued successfully that the cost of a lost day’s production was too great for the country to bear. This year, by using flexitime and by swapping holidays, government staff have been encouraged to take the day off. But Mr Salmond wanted something more formal, and said the existing “enabling” legislation would eventually achieve his goal. “We will be looking to establish ... St Andrews day as a full holiday. We are talking to our staff about that, and then will spread it from there. We know it has to be voluntary because of the legislation, but I think it will gather pace and become a national holiday over time. We will be leading by example,” he said. This year’s St Andrews day is seen as a prelude to a winter spectacular of events, scattered over Hogmanay and Burns Night, once a simple night of poetry and haggis eating which has been magically extended into something the government calls “the Burns season”. The first minister predicted that business would soon see the benefits of these celebrations. “As the marketing aspect of the Winter Festival kicks in many businesses will see the commerical as well as the social advantages of celebrating St Andrew’s Day and promoting Scotland over the winter months,” he said. Taking his cue from Edinburgh’s Hogmanay – which has twice been rained off in the last four years – Mr Salmond said these events would combine to project “Scotland the place to be over the winter months”. Cynics will suggest that Barbados has a strong claim in that respect, particularly since questions remain over the quality of the fare on offer which is intended to kick start Scotland’s winter tourism initiative. Travellers who favour beach bars, palm trees and water skiing may not be tempted by St Andrew’s day celebrations which include a Doric cabaret night in Aberdeen, a ceilidh in Stirling and a living history display at Culloden, as well as a “shindig” in Glasgow, and a “jig” in Edinburgh. A flavour of the joys to come was provided by the pupils of St Margaret’s primary school in Loanhead, Midlothian, where the first minister appeared with secretary for Education, Fiona Hyslop, and the London-based Scottish singer, Sandi Thom. Adorned in tartan ribbons, the children performed Westering Home, Mairi’s Wedding and Scotland the Brave, favourites chosen from their repertoire of Scottish songs which includes Johnny Cope, a victory celebration of the rout of the English at the battle of Prestonpans in 1745. Mr Salmond has faced criticism from some quarters this week for using children to promote nationalist propaganda, but he dismissed these attacks. “This is not Scottish propaganda, this is Scottish promotion. This is Scotland. The saltire doesn’t belong to the SNP it belongs to the country. As you can see the children here don’t need any encouragement to celebrate their Scottishness,” he said. “Schools are an essential part in celebrating the national day. You would have to have the most enormously developed Scottish cringe to believe [otherwise]. It is the normal thing for people in Scotland and across the world to celebrate their nationality and to understand and respect other people’s nationality. That’s what being a young self confident Scot is all about.” he said. The first minister also dismissed the remarks of Jeremy Paxman, the presenter of the BBC Newsnight programme, who spoke this week of his pleasure in baiting “chippy” Scottish politicians. “You have to take these things in good part. A gentle, patronising of Jeremy is the correct way to treat him. I enjoy his humour and I hope he enjoys mine. You’ve got to be grown up and adult and not too worried about banter, that’s the way it is,” he said. If 80% of British laws are to be made in Brussels, Devolution then must be a Socialist EU Trojan Horse. It is worthless. It's only value is as a divide and conquer (the Union) policy. Headed for an EU Soviet type Police State. Social Engineering, are we to become Islamic, , Now that Peak oil is upon us, have we been sold out for Oil.